6 pieces sushi and 4 pieces roll. 9 pieces sushi and 4 pieces roll. 15 pieces sushi and 4 pieces roll. 5 pieces sushi, 6 pieces sashimi and 4 pieces roll. 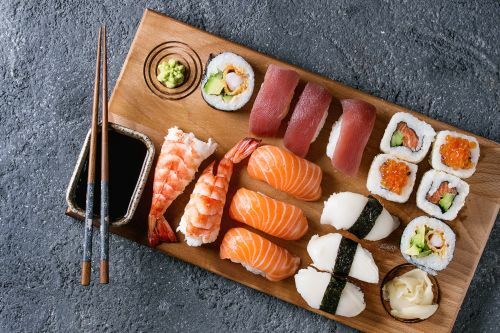 9 pieces sushi, 9 pieces. sashimi and 4 pieces and roll. Crab meat, avocado, cucumber and carrot. Cooked tuna, sesame, cucumber and spicy powder. Deep fried soft crab with avocado cucumber carrot and crab meat. Chicken katsu and avocado with mayo. Cream cheese, tempura prawn, cucumber and mayo. Cream cheese, chicken katsu, cucumber and mayo. Salmon and avocado topped fresh salmon. Grilled salmon on top of Califonia roll with special sauce. Fresh tuna with avocado, cucumber, carrot,crab meat and spicy sauce. Tempura prawn, avocado cucumber, crab meat. carrot, roll topped grilled sauce. Avocado, cucumber,carrot crab meat topped fresh raw fish. Pan fried dumpling (prawn with vegetables). Pan fried dumpling (pork with vegetables). Steamed dumplings with pork and vegetables. Homemade deep fried vegetables roll. Deep fried prawn and vegetables roll. Deep fried octopus ball with spicy mayo and fruit sauce. Battered soft tofu with dashi broth. Japanese pancake with pork and vegetables. Japanese pancake with seafood and vegetables. Popcorn sized tempura prawn tossed with spicy mayo. Deep fried soft shell crab with tartare sauce. Mixed fresh green salad with salmon and avocado. Sauteed salmon fillet with teriyaki sauce and rice. Sauteed beef fillet with teriyaki sauce and rice. Sauteed chicken fillet with teriyaki sauce and rice. Deep fried bean curd and vegetable with teriyaki sauce and rice. Marinated beef in special soy sauce on a sizzling plate and rice. Sliced pork marinated in chilli sauce on a sizzling plate and rice. BBQ chicken with homemade spicy sauce and rice. Deep fried crumbed chicken cutlet with fruit sauce and rice. Stir fried prawn and veg with chilli sauce. Deep fried prawn and veg with chilli and sweet sour sauce. Deep fried chicken and veg with chilli and sweet sour sauce. Marinated beef or spicy pork with fresh lettuce. Rice and mixed seasoned vegetables with chilli sauce, sesame oil and egg on top. Rice and mixed seasoned vegetables and beef with chilli sauce, sesame oil and egg on top. Rice and mixed seasoned vegetables and chicken with chilli sauce, sesame oil and egg on top. Served with Rice, 1 Main Dish of your choice, Tempura (Prawn or Vegetable), Mool Mandoo (4 Pcs), Salad and Miso. Lightly batter and deep fried vegetables. Lightly batter and deep fried, 2 pieces prawn, 2 pieces vegetable. Lightly batter and deep fried, 3 pieces prawn, 5 pieces vegetable. Lightly batter and deep fried prawn. Japanese soy flavored noodle soup with vegetables. Japanese soy flavored noodle soup with vegetables and chicken. Japanese soy flavored noodle soup with vegetables and beef. Japanese soy flavored noodle soup with 2 pieces. tempura prawn, 2 pieces tempura vegetables. Japanese soy flavored noodle soup with vegetables and chicken katsu. Japanese stir fried noodle with vegetable. Japanese stir fried noodle with vegetable and beef. Japanese stir fried noodle with vegetable and chicken. Japanese stir fried noodle with vegetable and pork. Japanese stir fried noodle with vegetable and seafood. Fried rice with vegetable and prawns.